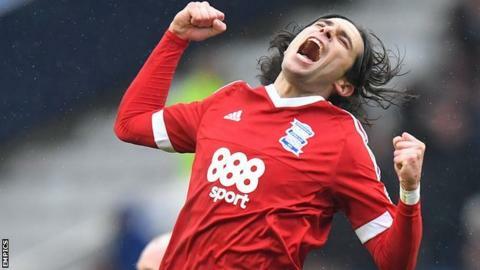 Birmingham City kept up their strong recent form with a comfortable victory at nine-man Sheffield Wednesday. David Davis poked in after the Owls failed to clear a corner before Jota made it 2-0 with a low shot from range that went through keeper Joe Wildsmith. Marco Matias was red carded for an off-the-ball incident before Jota tapped in his second from a rebound. Sub Lucas Joao pulled one back after the break before Daniel Pudil was sent off for a second bookable offence. Joao's goal was Wednesday's first in four Championship games under new boss Jos Luhukay but they remain without a win in the league since Boxing Day. The hosts went into the game off the back of a 3-1 FA Cup win over Reading but trailed within 10 minutes and things got worse when Jota's shot went under Wildsmith. Luhukay took off defender Glenn Loovens for striker Lucas Joao after just 26 minutes as he sought a way back into the game but a red card for Matias, after an altercation with sub Cohen Bramall, and Jota's second goal effectively ended the game as a contest before the break. The only downside for Blues, who have now taken 10 points from five Championship games this year, was having full-back Jonathan Grounds stretchered off in the first half. "It was a disappointing day for us. It goes wrong, whatever can go wrong did in the first half. "We went two goals behind where we made very big mistakes for the first and second goal. "After that we also had the red card. I don't know what the referee has seen from that situation. "From my position it was just a hot moment between two players but the referee decided for the red card so, for us, it was very hard." "Our first-half performance we were really pleased with. In the second half, probably just that little 15 minutes that we were a little bit disappointed with. "When they came out, they had nothing to lose, so we don't need to bet the ranch and go on and get a load of goals. "All in all, we've had some things go against us this season. "Maybe in the second half of the season those things are going to come back and be on our side." Match ends, Sheffield Wednesday 1, Birmingham City 3. Second Half ends, Sheffield Wednesday 1, Birmingham City 3. Corner, Birmingham City. Conceded by Frederico Venâncio. Attempt saved. Jeremie Boga (Birmingham City) left footed shot from the left side of the box is saved in the top left corner. Assisted by Jason Lowe. Attempt missed. Lucas João (Sheffield Wednesday) left footed shot from outside the box is too high. Assisted by Liam Palmer. Substitution, Birmingham City. Jason Lowe replaces David Davis. Attempt missed. Adam Reach (Sheffield Wednesday) left footed shot from a difficult angle and long range on the right is high and wide to the left from a direct free kick. Foul by Cheikh Ndoye (Birmingham City). Substitution, Sheffield Wednesday. George Boyd replaces Atdhe Nuhiu. Substitution, Sheffield Wednesday. Jordan Thorniley replaces Jacob Butterfield. Attempt missed. Jota (Birmingham City) left footed shot from outside the box is too high from a direct free kick. Second yellow card to Daniel Pudil (Sheffield Wednesday) for a bad foul. Foul by Jacob Butterfield (Sheffield Wednesday). Attempt missed. Jacob Butterfield (Sheffield Wednesday) left footed shot from outside the box is close, but misses to the right. Assisted by Lucas João. Attempt saved. David Davis (Birmingham City) right footed shot from the left side of the box is saved in the centre of the goal. Assisted by Jeremie Boga. Goal! Sheffield Wednesday 1, Birmingham City 3. Lucas João (Sheffield Wednesday) left footed shot from the left side of the box to the bottom right corner. Assisted by Atdhe Nuhiu with a headed pass.